The Skunk Ape, Stink Ape or Swamp Monkey is a cryptic hominid said to dwell in the Southeastern United States, from places such as Oklahoma, North Carolina, and Arkansas, although reports from the Florida Everglades are particularly frequent (Florida skunk ape). Skunk ape sightings, while rare, have been reported all through Florida for more than six decades but by no means have been verified scientifically. There was a large wave of sightings in the 70s, all consistently describing the creature as reaching about seven feet tall, weighing 300 pounds plus and to be strongly foul smelling. Since then the popularity of the Skunk Ape in southern Florida has continued to increase, along with the number of alleged sightings. The Skunk Ape is described as a big, hairy, stinky, swamp-dwelling creature similar to the well-known elusive mysterious Bigfoot or a big chimp as the name suggests. There are many in the Bigfoot research fields that believe Skunk apes to be a variety of the infamous Bigfoot of the northwest. 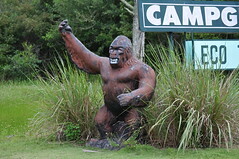 Many reports also depict the Skunk Ape as having glowing red or green eyes; however, this is in general attributed to the reflection of a flashlight or automobile headlights when the creature is spotted at nighttime. It has been reported that both male and female are covered with reddish-black fur and also have outstanding hearing as well as the skill to climb trees and swim rapidly in order to evade detection or capture. Hence, causing great problems in photographing or capturing one. It is named for its appearance and for the repulsive skunk like odor that is said to go along with it. According to the United States National Park Service, the skunk ape exists only as a local lore and myth. Skunk Ape sightings were most prominent in the 1960’s and 1970’s; nevertheless many still claim to have seen it and try to track the elusive beast to this day. Skunk Apes are said to kill livestock and be particularly hostile to cats and dogs. Skunk Apes are believed to be rather strong and tough, with one actual report stating that a skunk ape did not even flinch when attacked by a tracking dog. However, there has never been a recorded case of any person ever being physically attacked by a Skunk Ape. Wasn’t that recent skunk ape video on the Youtube of it running across a swamp field proven to be a fake? How is the skunk ape related to Bigfoot? Are they same or different animals. Mike345 from what I understand the skunk ape is considered a type of bigfoot too. Its kind of like its swamp cousin version. Mostly the same, but usually a bit smaller and seems to really stink, hence the name. Thank you Tim for the answer, now I understand. Maybe its a different bigfoot species, but still a type of bigfoot non the less.